Splash pages, you gotta love 'em. A blank canvas where the artist can hit you with a large dose of illustrated 'wow'. In my last post, I mentioned Wolverine #127 had a sole redeeming feature - it contains a pretty cool splash page of a poster, and here it is. Sabretooth is my all time favourite Marvel villain (unless Doc Doom is being written right), and like his hair-balled opposite number, few draw him better than Leinil Francis Yu. Having him parody the Titanic, well that's just the cherry on the iceberg cake. I've got this one too Dan. Such a good arc by Claremont and Yu, especially the earlier one "White Ghost" by Ellis and Yu. So 'Tooth's your fav Marvel villain huh? Interesting. 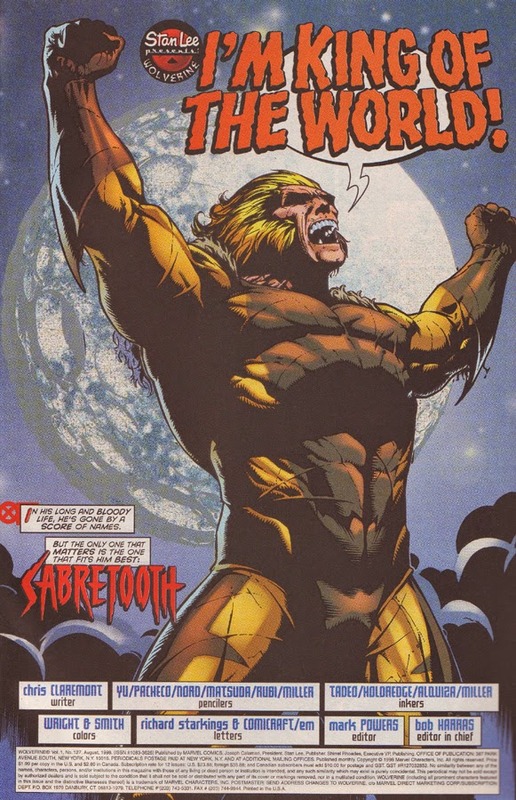 I'll also agree that Yu and Jim Lee are one of the few to really render Sabertooth right. Sure is Dale. It used to be Electro back when I was a kid, but Victor I think is tops. Well written Doom trumps all but that's hard to find. Vic is in the masthead of the site, one of the few figures I have and I think the most unsung comic movie performance of all, thsnks to X-Men Origins: Wolverine. Liv did a fantastic job and could easily be used again... maybe a bit bulkier though.